During our recent trip from Florida to New York we tried out our newest worksheet - "Planning Your Route." When we move to a new workamper position, it is usually quite a distance or across the country so it takes a significant amount of planning of how long it will take to get there, what highways are best to travel on, and what we want to see along the way. For us, it is better to take our time and relax along the way so we aren't so exhausted when we get there. I made up a worksheet to document our plan of travel for each day including how many miles we would travel, the route we would take, and campgrounds to stay at along with contact info, etc. 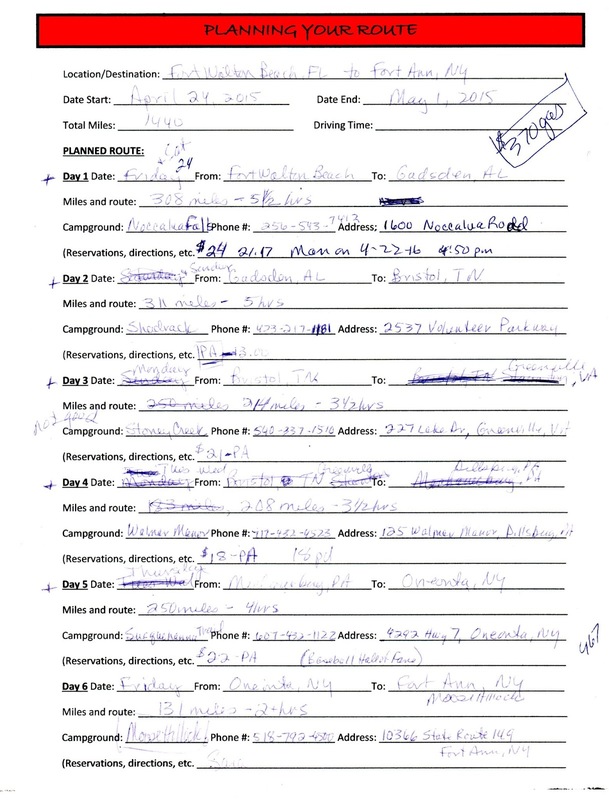 Below is the first Planning Your Route worksheet we used as we traveled from Florida to New York. As you can see it has some scribbles and changes as of course you have to be flexible as you travel! We loved the first place we stayed in Alabama so much that we decided to stay two days and thus changed all my meticulous planning! But it was well worth it and we had plenty of time to make these adjustments. When planning your own trip, of course the first thing you need to do is check out your maps, whether online or paper, to see the exact route you want to take, how long it will take to get you from Point A to Point B, and how many miles you need to travel each day to get to you destination in the allotted time. You can then also decide how much time you can take to sight see too. When you decide how many miles you want to travel each day start looking for nearby campgrounds comparing prices and amenities. We did join Passport America to try to save a few bucks on our cross country trips and it did seem to save us quite a bit on our spring trip. On the Passport America website you can check out the parks that are available and their fees. I also do extra research on a few review sites like Trip Advisor and RV Park Reviews to get some other opinions on the RV parks. You can then document on the worksheet the amount of miles you want to travel each day and the exact route you will take. 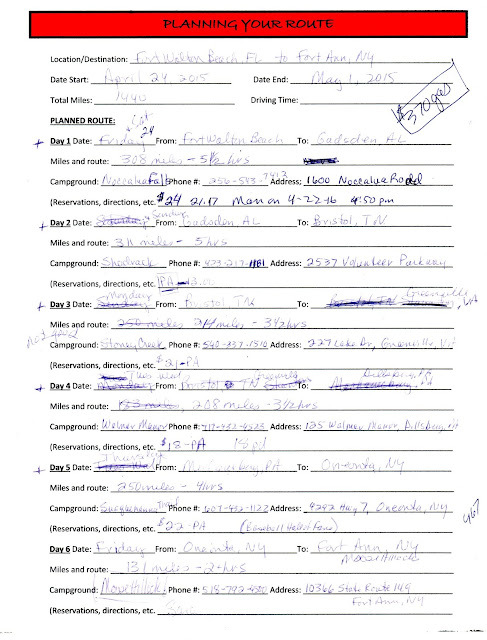 Also write down the campground you would like to stay at along with their contact information. We normally don't make reservations very far ahead in case our plans change. Also most campgrounds are not very busy in the spring and fall when we are traveling so I usually call them the day before or the day of to make a reservation. However, if you are traveling during the peak season, I would definitely call them ahead of time to check availability. Once you have decided on a definite plan, write down your plans for each day so you just have this one sheet to refer to each day as you travel. Of course, this plan doesn't have to be set in stone but it is a good guide to keep you on track to get to your final destination on time. 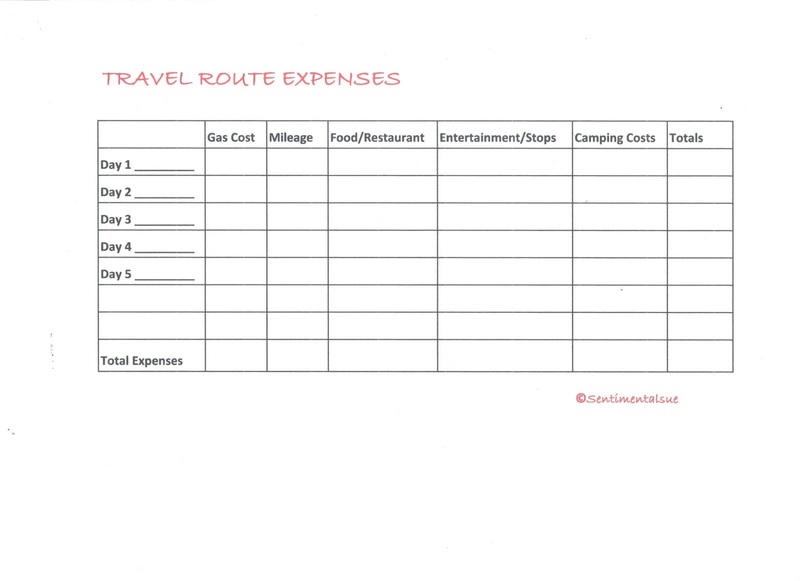 I also made a very simple spreadsheet to add your expenses for each day including gas, food, entertainment and camping costs. You can document your costs as you travel or at the end of each day you can simply check your receipts and write them down on the spreadsheet. Of course this step isn't absolutely necessary but if you want to track your expenses, this is very helpful. I would love to share my worksheets with you! 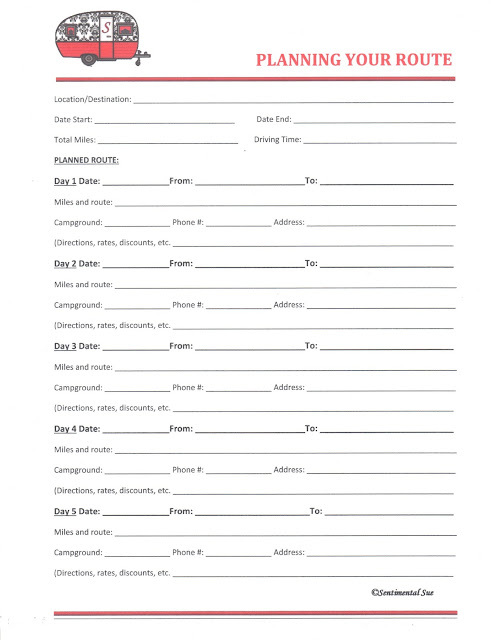 Simply subscribe to my email list and you will receive a link to all my worksheets including the worksheets on "Interview Questions" and "RV/Camper Information" and "Vehicle Information." It is that time of year again when we need to start planning our fall trip! This time we are headed to Texas but we should have enough time to take a little detour through South Dakota and Nebraska to see our kids, my mom, and other family. Yeah! Sometimes I miss them all so much - I wonder if this workamping and traveling is worth it!? Anyone else feel this way? I guess we will explore that in a blog post for another day! That is a great idea Carol! I do the same thing! Thanks for sharing that and I will see if I can squeeze that in somewhere! Hitting the Road to New York For Our Summer Job!